After winning the World's Best Dark Beer award for its Unibroue 17 in 2010, Unibroue just received the World's Best Belgian Style Witbier title for the Blanche de Chambly, at the World Beer Awards in London U.K. The brewery's classic wheat beer, celebrating its 20th anniversary this year, was chosen among nearly 600 beers entered from 32 countries. This is the Blanche de Chambly's third nod from the WBA, which had declared it World's Best Spiced Wheat Beer in 2011, and The Americas Best Spiced Wheat Beer in 2010. 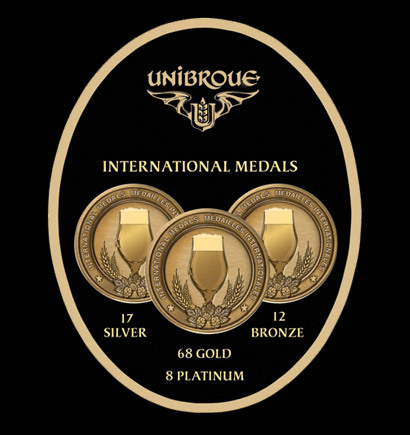 "The fact that our creativity and brewing expertise keep being recognized", says Sylvain Bouchard, beer sommelier at Unibroue, "after having garnered over 185 international awards for our products, such as La Fin du Monde, Quelque Chose, Terrible, Maudite, Trois Pistoles, Unibroue 17 and Éphémère Apple, only reinforces our position as a leader among the world's brewers." After a blind taste test, the Blanche de Chambly was crowned "World's Best Belgian Style Wheat Beer" by a prestigious international jury. Throughout the years, the following beers have also been rewarded for their excellence in various categories: Unibroue's Don de Dieu (World's Best Belgian Strong Pale Beer), Quelque Chose (World's best fruit wheat beer), Maudite (America's best amber Pale Ale), Unibroue 17 and Blonde de Chambly (America's Best American standard Pale Ale), La Fin du Monde (America's best Blond/Golden Pale Ale. From its very first competition 20 years ago, and every year since, Unibroue has stepped up to the podium among the best beers in the world, in numerous international events. Its continuing success can be attributed to the consistent quality and constant innovation consumers have come to expect from this home grown brewery. With his 14 titles, Unibroue is the most rewarded Quebecois brewery at the World Beer Awards.